After cruising through space for about seven months, the time has arrived for NASA's Mars InSight mission to settle down on the Red Planet and get to work. The culmination of this almost 90 million mile journey is expected Monday, Nov. 26, at about 12:00 p.m. Pacific. To control its entry, small rockets will direct it toward the surface. Insight needs to enter the atmosphere at a precise 12-degree angle to avoid either burning up or bouncing off the planet's surface. Then, the spacecraft will release a large parachute to slow its progress, cast off its heat shield and extend a trio of shock-absorbing landing legs. Finally, the lander will separate from its backshell (a protective covering) and parachute. A dozen engines, known as retro rockets, will begin firing to help the lander set down gently on the Martian soil -- its new permanent home. Want to watch? Read on. 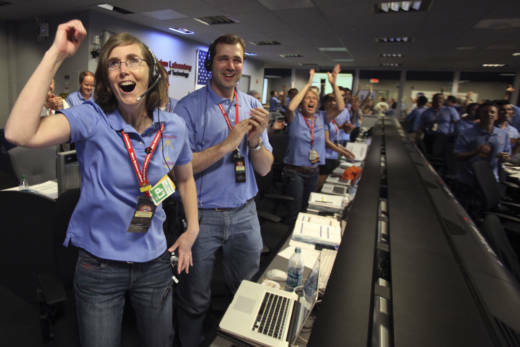 NASA will webcast the landing and the scene from Mission Control at NASA's Jet Propulsion Laboratory in Pasadena. You'll be able to watch on KQED Science (link will be live at 10:30 a.m. Monday, Nov. 26) or directly on the agency's website. There may be a viewing party planned near you. Check the map below.